Many programs and system services save temporary data on the hard drive. A few popular examples are Internet browsers such as Microsoft's Internet Explorer or Mozilla Firefox, Office programs like Word or Excel, Windows Explorer or pdf readers. Besides filling the hard drive with unnecessary files, those temporary files may also leak private information to third parties. It is therefor recommended to clean the temporary files regularly to recover disk space and reduce the risk that someone else finds data on the computer that leaks private information. The most popular third party tool for Windows to clean temporary files is CCleaner. Why? The program supports lots of different temporary file locations out of the box, is very thorough with the cleanings and offers to include custom locations to include in the cleaning. We have recently had several articles on how to enhance CCleaner, including articles about the CCleaner Auto Updater, CCleaner Enhancer to add more programs to the application and a tip on how to run CCleaner automatically for all accounts. But this review is not about CCleaner, it is about Moo0 DiskCleaner. It is very similar to CCleaner, in that it offers to delete temporary files on the hard drive and the system Registry. The disk cleaner is available in 17 languages as a portable version and an installer. The application scans all supported temporary file locations on startup, and displays those that have been found in its interface. The remaining programs are hidden by default, but can be revealed by removing the Show only Related checkmark in the main interface. That's interesting, as it provides a full listing of supported applications. The scan is a lot faster than that of CCleaner. Each temporary location is displayed with a title, size occupied on the hard drive and items found in the location. Checkboxes at the beginning of each row can be used to select items for deletion. A click on the arrow at the very beginning of each row reveals the locations or paths of the files on the system. The Recycle Bin entry will for instance list the recycle bins of each partition separately. Cookies are displayed individually, so that they can be selected separately for deletion if needed. The program displays the Megabytes and total item size on the Clean Now button, and updates the count automatically whenever a new selection is made. Moo0 DiskCleaner supports adding custom targets like CCleaner, but with additional options. CCleaner only supports file locations (correct me if I'm wrong about this, but the include menu seems to suggest it), while DiskCleaner supports Registry locations as well. DiskCleaner is a solid alternative to CCleaner. Both programs have their distinct strengths. CCleaner for instance can be configured to protect certain cookies from deletion, a setting that it remembers after restarts. Another feature of CCleaner is the ability to secure delete the files so that they cannot be recovered with file recovery software. Moo0 DiskCleaner is compatible with 32-bit and 64-bit editions of the Microsoft Windows operating system. Interested users can download the portable version or installer from the developer website. There’s one feature that SEEMS to be missing from all of these programs. That’s the ability to clean multiple profiles without running the app from each user. I service a lot of (especially) XP systems where every family member has their own profile (I’ve seen as many as 6). I like to remove the garbage files prior to running malware scans. However; it’s very time consuming to have to open each profile and run a cleaner. This app seems to be a viable alternative to CCleaner. Thanks for the review! 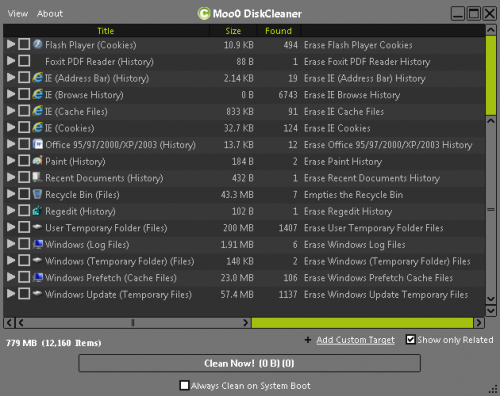 CCleaner alternative Moo0 DiskCleaner looks good,thanks. I using Glary’s Utility Pro,it is just as good as the above two mentioned.